Bondi Pavilion is an iconic arts, community and cultural facility serving the community of Bondi and Sydney. Bondi Pavilion’s facilities include the Bondi Theatre, exhibition spaces, meeting rooms and more. Bondi Pavilion currently plays host to many activities with a strong community focus, including art exhibitions, community education classes, workshops, screenings and more. It is the vibrant heart of a strong local community as well as being a drawcard for visitors from across Sydney and the world. Waverley Council has been considering the “Bondi Pavilion Upgrade and Conservation Project” since 2008. This process has been marred by an undemocratic process where a liberal majority has forced through proposed changes to the . Stage 1 changes include repair works, upgrades to toilet facilities and installation of solar panels. After strong community pressure, stage 2 changes have been deferred until after the September 2017 Local Government elections. This second stage of development proposes increased private for-profit use of the Pavilion. This includes the proposal to evict community groups and close public areas to provide long term private rental for restaurants and other for-profit renters. This would substantially reduce public access to the Bondi Pavilion and give businesses priority access to space. The proposed redevelopment of the Bondi Pavilion is part of a state-wide pattern of public assets being sold off, privatised, leased or developed by the Liberal National government. This is part of the fight to stop Sydney’s soul from being privatised. Think about all the extraordinary places in Sydney looking over the harbour, every other one has been taken over by corporate interests. This is quite literally for Bondi drawing a line in the sand. We are going to hold this for the community. 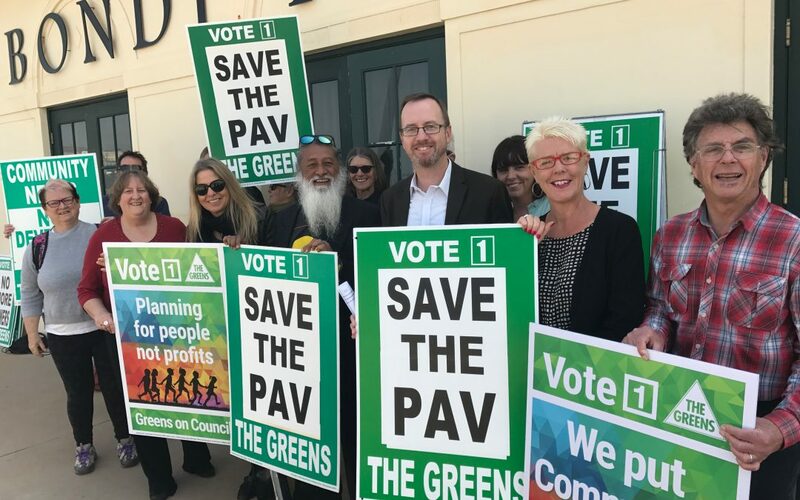 Greens MP David Shoebridge has introduced the Save Bondi Pavilion Bill 2017 to protect Bondi Pavilion from sale, and to ensure that community access is retained. We’ll be calling on a vote before the end of 2017. The bill creates a standalone Act called the “Save Bondi Pavilion Act 2017”. The Act would become law on the day that it received assent from the Governor after passing through both houses of Parliament. Clause 3 of the proposed Act defines the operation of the bill to the building known as Bondi Pavilion. Clause 4 specifies that Bondi Pavilion must remain in public ownership and cannot be sold or leased contrary to the provisions of this Act. Clause 5 required Bondi Pavilion to be primarily used for community accessible public purposes. These simple legislative measures would ensure the protection of Bondi Pavilion for generations to come, while still allowing appropriate renovations, repairs and enhancements to the facility to ensure that it continues to play a key role in the social fabric of Bondi and surrounds. Callan Park is the site of the former Rozelle Psychiatric Hospital and has strong local and heritage significance, just like Bondi Pavilion. It has been used by the community for community, arts. educational, health and not-for-profit purposes. In 2002 the NSW Parliament passed the Callan Park (Special Provisions) Act 2002. The act preserves the public ownership of Callan Park, protects its current features and restrict its future use. The Callan Park Act ensures that the whole of Callan Park remains in public ownership and subject to public control, to preserve open space, including preserving public access for public recreational purposes of both an active and a passive nature. This has been key in ensuring Callan Park has been protected in the last 15 years, notwithstanding substantial local developer pressure. If it is good enough for Callan Park, it is good enough for Bondi Pavilion. 1. Is stand-alone legislative protection for Bondi Pavilion appropriate? 2. Does clause 4 of the bill provide adequate and appropriate protection for Bondi Pavilion? 3. Does clause 5 of the bill adequately protect community access to Bondi Pavilion? 4. Are additional protections required?